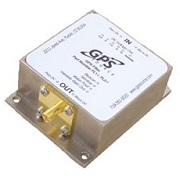 The L1L2F GPS L1/L2 Bandpass Filter is an in-line one input one output RF device. Designed with thin link margins of satellite navigation systems in mind the L1L2F features excellent side band rejection with an insertion loss less than 5dB. The L1L2F is available with more options than any competitive product in the market.